This is a spinning wood merchandise display. This wood merchandise display has many compartments for displaying a multitude of different items. The merchandise display is constructed of a highly durable and stable solid baltic birch wood material. 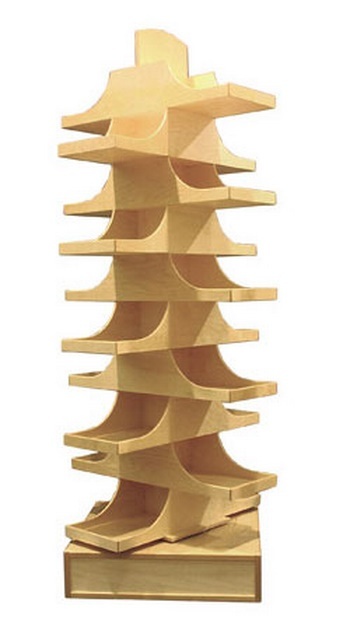 The tall design of this wood merchandise display saves valuable floor space. This wood merchandise display has a rotating base built in. This makes browsing through the wide selection of displayed items much easier. The simple design blends well with any pre-existing décor. We also build custom wood merchandise display if this design does not fit your requirements exactly. When checking out leave the code for your chosen finish in the notes section. If you could not find a suitable finish or need to do a color match contact us directly and we will work with you personally to satisfy your display needs.